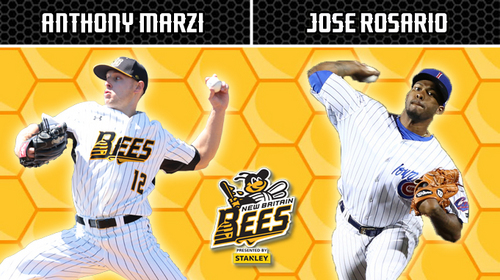 (New Britain, Conn., April 9, 2019) – The New Britain Bees today announced the signings of pitchers Anthony Marzi and Jose Rosario. Anthony Marzi returns to the Bees for his fifth season of professional baseball and third in the Atlantic League. Last year, the Berlin, CT native split time between Double-A Chattanooga and Single-A Fort Myers of the Minnesota Twins organization. He made 28 appearances (16 starts), and posted a 4.62 ERA with 91 strikeouts in 109.0 innings pitched. The 26-year-old was originally signed as an undrafted free agent by the New York Yankees in 2015 after a successful collegiate career at the University of Connecticut. He would make his Atlantic League debut with New Britain the following year, and would also spend the 2017 campaign in the Hardware City before having his contract purchased by the Twins. In 48 combined appearances with the Bees, the lefthander collected a 10-6 record with a 2.94 ERA and 95 strikeouts over the course of 147.0 innings of work. In 92 career minor league outings (42 starts), Anthony owns 18 wins with a 3.25 ERA and 234 strikeouts in 324.0 innings pitched. Jose Rosario heads to New Britain for his 10th season of professional baseball and first in the Atlantic League. He last pitched in 2017 as a member of the Chicago Cubs organization, splitting time between Triple-A Iowa and Double-A Tennessee. The 28-year-old was originally signed as an undrafted free agent by the Cubs in 2008, and spent his entire professional career with the organization, reaching as high at the Triple-A level. His most impressive campaign came in 2016 when he split time with Triple-A Iowa, Double-A Tennessee, and Single-A Myrtle Beach. In 45 combined appearances, the righthander posted a 2.50 ERA with 14 saves and 47 strikeouts over the course of 54.0 innings of work. In 176 career minor league outings, Jose owns 28 wins with a 4.84 ERA, 17 saves and 440 strikeouts in 509.0 innings pitched.